As I write, the schools are involved in end-of-term examinations, and the teachers are eagerly awaiting their two-week holiday. This first term of the new school year has, to be honest, been somewhat exhausting. Some good teachers were transferred, and one left teaching altogether. With our progression into Primary 3 we were always going to have new teachers on the programme, but we did not expect to find, at one school, a new teacher for Primary 1, who had never taught English before and will leave next month to have a baby. Another of our schools had half of their Primary 3 pupils without an English teacher at all until an untrained, temporary teacher was engaged just three weeks ago. However, it is problems such as these that a strong programme should be able to overcome, and at the end of the term I think we are overcoming them and the pupils are on-track with their learning. 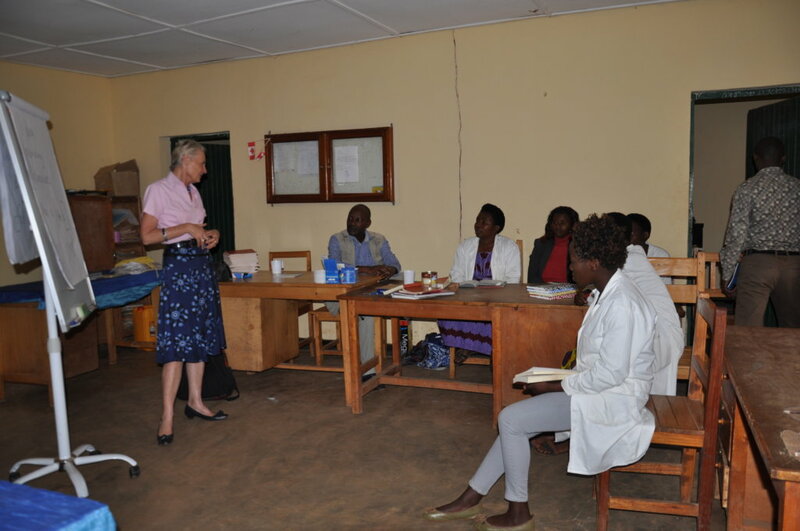 We have trained the teachers who are new to our programme in the use of our materials, and particularly how to know what the pupils, now in Primary 2 and 3, have already learned, and how to run a short revision course. We have trained teachers who are teaching Primary 3 how to engage their pupils and stretch them, now that their age and, hence, cognitive ability enables them to cope better with the demands of learning English. One disappointment was that a much awaited appointment to see the Minister for Education was cancelled at the last minute. I now hope to see him in May, as April is very much taken up with the memorial for the genocide anniversary, and then Easter. I have wanted an opportunity to see the Minister again, after I delivered the report to him which he requested of me. That was back in September and I have had no feedback from it. It seems that a shortage of government specialists in primary education and how children learn may be causing a blockage on how to deal with the points I raised, and the detailed suggestions for improvement which I made. The disappointments are always counteracted. One uplifting instance reported to me, was when the head teacher at Kibara primary school had to ask the Primary 3 English teacher, Jean d’Amour, to help on an urgent task which meant he could not teach his Primary 3 class. The class monitor and one other went to the head teacher and asked if they could use the Wall Charts which accompany our books. The head teacher took a few Wall Charts and put them on the wall. The class monitor then worked with all the other pupils to ask and answer questions in English and to conduct their own English lesson. That was music to my ears; the pupils love the success they are experiencing in learning English and they love the methods used which give them real life situations to speak English. It is the one subject with materials which match their cognitive ability and push them to develop and think. Josephine who teaches Primary 1 and Primary 2 at that same primary school has been the star of this term. 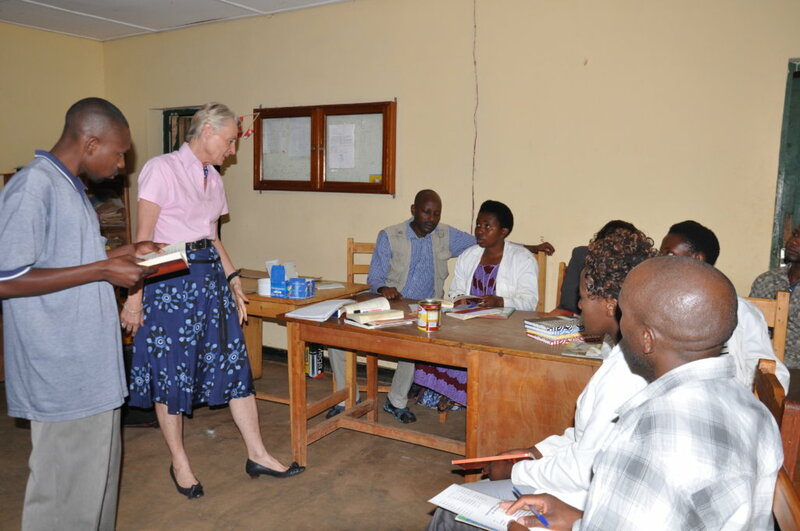 Her classes have over 80 pupils registered, and she regularly teaches anywhere between 75 and 85 pupils in one class. The schools have morning and afternoon school, the ‘double shift’, in order to cope with the large numbers of children. That means that every day between 7.20am and 5pm Josephine teaches about 320 pupils, and she knows the names of all of them! Her lessons are lively, and she maintains a smile all day long. 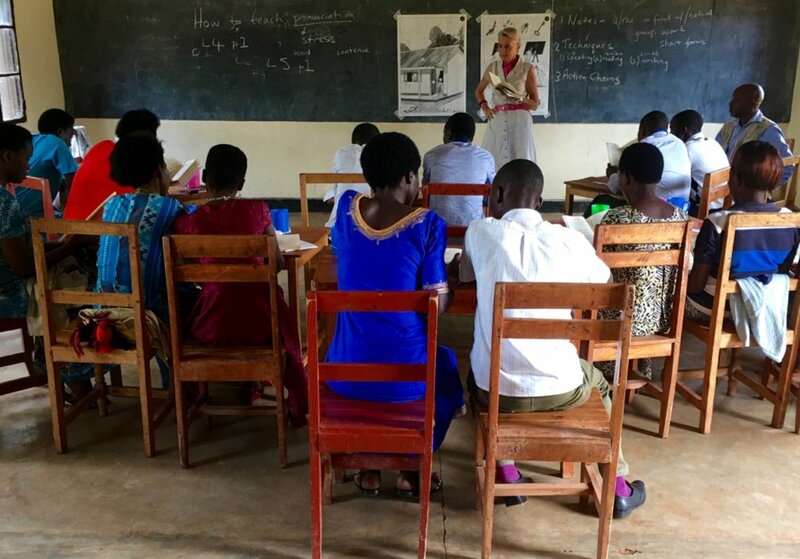 Josephine did not train to teach English, as teacher-training in Rwanda is split into specialities even at primary school level, but started teaching English when she was posted to Kibara last year and joined our programme. She loves using our books and she has benefited from the instructions and explanations in the teacher’s books being in Kinyarwanda. The methodology is explained and Josephine has adopted it completely, and her own English has progressed from non-existent to really quite good. The books tell the teachers what to say in English, and that means that they can teach good English lessons without having much confidence in the language themselves. Josephine’s skills now enable her to keep all her pupils (yes, that is all 80 of her seven and eight year olds) enthralled, on-task, and participating in her lessons. We have been so impressed that we hired a camera man to come to take a video of her lessons, and that of the Primary 3 class at Gasabo primary school. These videos are now evidence, that we can show to government officials, of how successful our project is. The pupils on our programme know more English than those in the classes above them. Josephine herself says that Primary 6 pupils come to consult her Primary 2 pupils and Jean d’Amour’s Primary 3 pupils on problems with English. Somewhat exhausted but also more than somewhat pleased is how I wind up this first term. Our plans for next term include hosting a workshop for government officials. It was in November 2017 that we held our first workshop for government officials, and many of those are now no longer in office. We would also like to plan to scale-up to include many more schools and to get the funds to do so. A very big ‘thank you’ to all of you who give towards our work and care about the futures of the primary school children in our schools. Knowing English will be their passport to a better life, not just for the language itself but also for the thinking skills and confidence which our approach is giving them. The last three months have been quiet. The school holidays started earlier than expected, and school examinations and national examinations were held before the end of term. The last teaching week was at the end of October. Before the end of term, on Saturday 13th October we held a seminar on Handwriting. 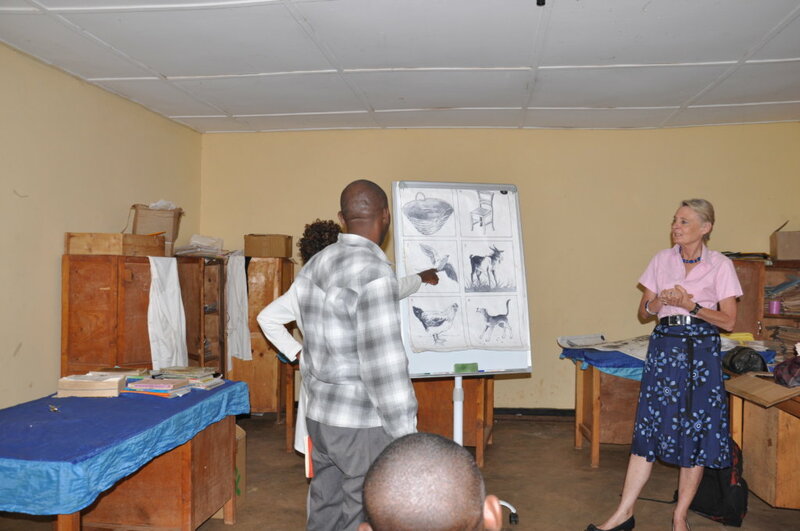 This was a great success with 58 teachers in attendance (as well as two babies who came on the backs of their mothers) from our project schools who teach pre-primary/nursery, and who teach Kinyarwanda and English to Primary 1, 2 and 3. 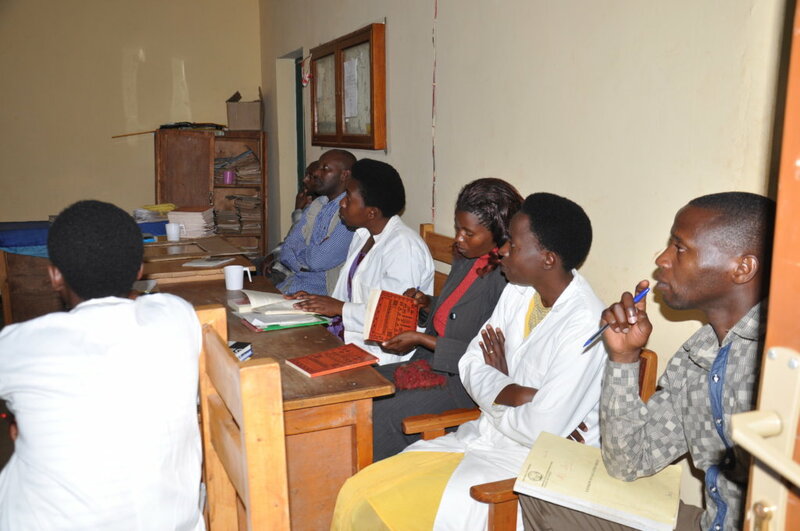 In addition, there were Directors of Studies from the schools, and one of the head teachers. The teachers imitated the patterns which young children should draw to prepare them for handwriting, and then the teachers were given time to practise forming the letters of the alphabet and to see that those letters should be introduced in ‘families’ according to the hand movement used in their formation. We talked about the need to introduce small (lower case) letters before introducing capital letters. This gave rise to a healthy discussion as the Rwanda curriculum introduces small and capital letters together. We then looked at the relation between reading and writing, and what that means for teaching each skill. Finally, we looked at the teaching of writing in English. It was a very lively half-day, and the teachers were most appreciative of such a relevant and useful seminar. Good news before the end of term was that we were able to get another car. This was essential as we cannot do our work without transport. A lot is expected of our car, travelling an hour each way on mainly rough roads to get to the schools. The old car is waiting for a decision to be made about its fate; whether to spend money on getting it road-worthy for a better sale price, or to try to sell it in its current condition! The new school year starts on the 14th January. The long holiday is a problem for us, as the pupils forget so much of their English! They only speak and practise English in their lessons, as no English is spoken in the normal course of their lives. The start of the new school year will not only mean the pupils getting used to new English teachers, but also having to revise most of last year’s work. A new school year brings changes in teachers, and decisions have to be made with each school about which teachers will teach which pupils. Some teachers like to follow their pupils to the next level, while others like to repeat their work with the materials they have already used. One head teacher wrote to me just the other day, ‘I am in preparation of starting the academic year 2019 purchasing school materials, sharing subjects to be taught, searching for teachers to replace those who went…’. This year we will be working with Primary 3 pupils, as well as those in Primary 1 and 2. It is in the first three years of primary school that pupils learn English as a foreign language. Once in Primary 4, all lessons are supposed to be taught through the medium of English. Our work this year will be crucial in our ‘action research’ to show that our approach to teaching English can and does prepare pupils properly for what is expected of them in Primary 4. The new school year is an opportunity to work with renewed energy with education officials on the need for change. The Minister for Education has yet to comment on the substantial report I submitted to him at his request as a ‘rationale for change’. 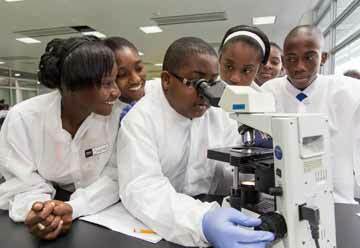 The President continues to place emphasis on the importance of education in the development of the country. My experience and the papers and reports that I have written, coupled with the very successful use of our materials, now need to be given attention at the highest level, and I will be aiming for that this year. At the ‘grassroots’ level we already have a proven track-record, and the same Head teacher as above added in his note, ‘I thank you so much because you are among the important people who have helped me with advice and help to enable me to fulfil my responsibilities in education, and I learned from you so much, and I wish to continue this year 2019’. For him, and all the teachers who work so hard to help their pupils, I will continue to work and help as best I can, and hope that 2019 will see not just more good results in English teaching and learning, but also developments towards much-needed change. Thank you to all our donors who give so generously and who care about the educational potential of the primary school pupils. It cannot be said too often, that one of the greatest gifts any child can be given is that of a good education. Let’s hope that 2019 will be a happy and successful year for us all. The final term of this school year started on 21st August, and with only a two-week holiday the teachers are visibly tired. The school year ends on 23rd November, and so the teachers have to grin and bear it and keep going! Our main focus this term has been on the handwriting of the pupils. Their handwriting in Kinyarwanda is of a very low standard. The pupils do not have proper exercise books which guide them to the size of the letters. They are taught capital and small letters together, and so they use capital letters without regard to any rules! The pupils do not leave spaces between words, and they are not encouraged to read what they have written. So, our work has been cut out for us. We are working with P2 pupils, who are now ready to write in English. I have written a special scheme of work for the teachers, and they use one or two periods a week to concentrate on handwriting. In a short time, there are great results, and the pupils now pay attention to the use of capital letters, and all have to read what they have written. 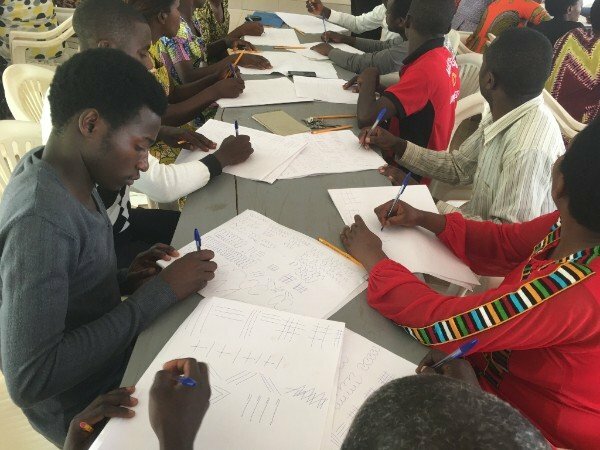 This work has been so much appreciated by Claude at Gasabo primary school, that he suggested that we run a hand-writing seminar for all teachers in Lower Primary. Many of the teachers do not form their letters correctly, and also use capital letters in the middle of words! The seminar is due to take place on Saturday 13th October. It’s going to be very interactive, with teachers encouraged to draw patterns that young children draw as a way of developing ‘fine motor-skills’ before they can start to write. The teachers will trace round all the small letters to make sure they can form them properly, and we’ll look at how to teach writing by ‘families’ of letters, such as all those that are formed with an anti-clockwise movement etc. We hope that this will be timely, so that the teachers can adopt these practices in the next school year. In June, the Minister for Education asked me to produce a report analysing the subjects taught in primary school, and to give him a rationale for changing the curriculum. This was quite a task. 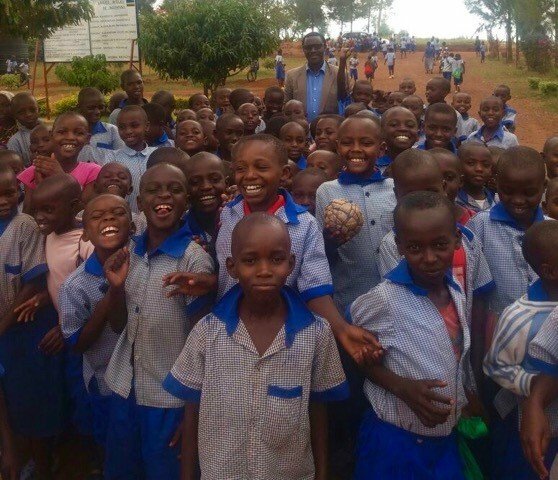 The first stage was to get the curriculum documents for maths and Kinyarwanda translated into English, as English is the only subject taught in English and for which the curriculum document is written in English for the lower primary (P1 to P3) classes. For my analysis of the maths and Kinyarwanda curriculum, I called upon Barbara Kerr for help. Barb worked in Tanzania with me from 2012 to 2015, and her expertise in primary school teaching, curriculum design, and teaching methodology is second to none. Luckily, Barb had some time before starting a new job in Indonesia, and so was able to look at the curriculum documents. It was very refreshing to work with Barb again! The report covers maths, Kinyarwanda and English, as those are the key subjects in lower primary, and runs to 70 pages of analysis and comment. The report was delivered on 24th September and I’m now waiting for an appointment to see the Minister for Education again to discuss it. The bad news is that our car here in Rwanda is falling apart. A lot is demanded of it – at least two hours’ driving every day to get to and from the project schools, on some very rough roads. Mechanics have advised that we sell it rather than incur substantial repair costs. Second-hand cars here have an extraordinary value, and we hope to sell this Toyota Rav 4 for the equivalent of about £5,000, but will have to put about £7,500 to buying a new one. The car has given us just over three years of service, and so perhaps we can’t complain. The end of the school year we hope will see some good test results in English. P2 pupils will be given a written test to see how they get on. The P1 pupils will remain with oral testing. The pupils will have a long holiday of about eight weeks before the new school year in January 2019, and I just hope that they don’t forget all the English they have learned. Thank you again to everyone who helps our work with donations. Those donations are what keep our work going, and it is such a shame that those who give so generously don’t get to see the children smiling, waving and running after the car as we arrive at their schools. They and their teachers love being on our English programme, and are so proud of their progress. Katy Allen-Mtui and the Hon. Minister for Ed. The second term does not end until the 3rd August which makes it a very long and tiring term for both pupils and teachers. The end of term examinations will be in the last week, and some revision will take place before then, and so the teaching weeks are coming to an end. We have two new teachers at Kibara primary school for teaching English to Primary 1 and Primary 2. This was difficult at first as the teachers had to assess their pupils’ knowledge and ability and that took time. However, the teachers adapted very quickly to using the NOEC books, and now their lessons are some of the best. Our New Original English Course (NOEC) books are the reason for the success of our work. The teachers appreciate having just one textbook. 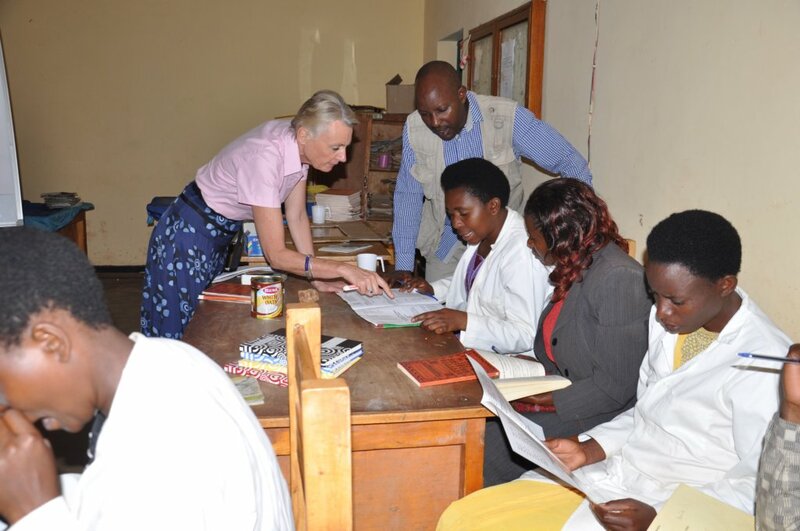 With the instructions and explanations in Kinyarwanda the teachers know what to do and how to do it, and, with the English which is to be taught being clearly set out, they are not making mistakes. The pupils are benefiting enormously from correct English being taught, and with the good teaching methods the pupils are literally seeing the meaning of the sentence patterns, and are then using them correctly. The teachers become ever more enthusiastic about the books as their pupils progress, and the Primary 2 teachers are so amazed by what their pupils can now understand and say in English that they cannot wait to see how they are in Primary 3 and Primary 4! Some English reading books were donated to us by a primary school in England, and the pupils have relished reading these. 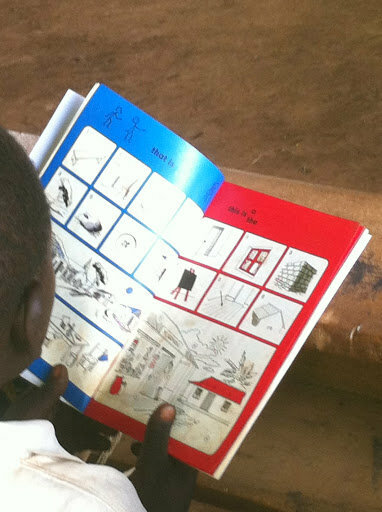 The language in the books is repetitive and so the pupils can manage to read and understand. These books have given more motivation and satisfaction. However, with over fifty pupils in a class, the teacher can only give the books to a few at a time, and then finding time to hear them read or check their understanding is difficult. 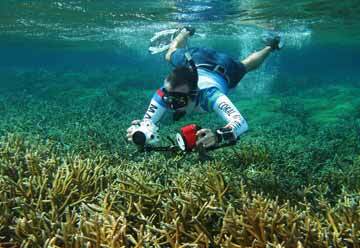 Our work is becoming more widely known and regarded. In the middle of June, I managed, at last, to see the new Minister for Education. He gave me a full hour of his time, and it was a most lively and open discussion. The Honourable Minister would like our work to expand and he is now working to help make that possible. The new school year starts in January, and he is aware of the financial implications of scaling-up our programme. This could be a most exciting development, possibly taking our NOEC books to two new districts with over 100 primary schools. I look forward very much to seeing how the plans develop, and I am already writing a full proposal with costings. Alongside that I am writing about the role of Kinyarwanda in the pupils’ primary schooling. 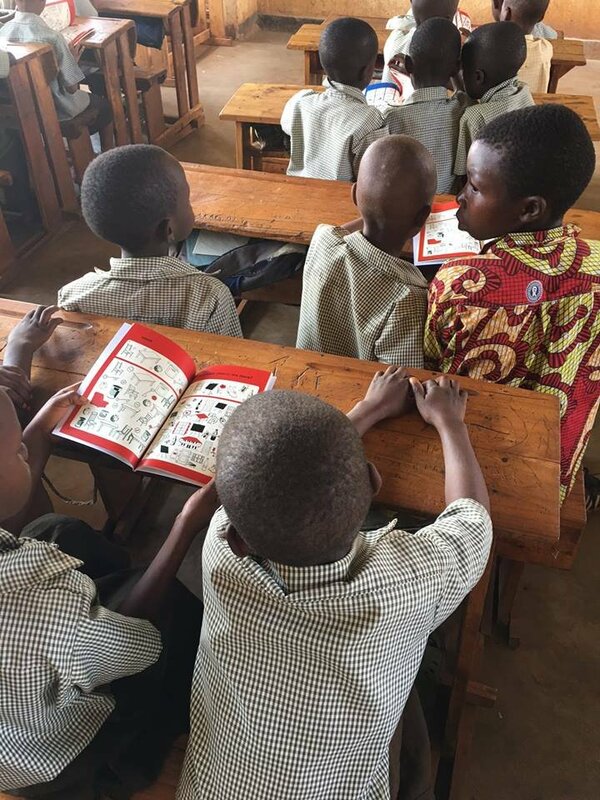 At the moment the pupils start to learn English in Primary 1, and their English studies have the same number of periods as their Kinyarwanda studies. I am of the opinion that the pupils need their literacy skills and initial thinking skills developed in their mother tongue without interference from a foreign language. Others are also of this opinion, but it will be an uphill struggle to change the status quo. However, it seems a battle well worth fighting, as the pupils’ writing and reading in Kinyarwanda is not of a high standard, and that in itself affects their ability to develop those skills in English. I remain busy, and also optimistic that our work will develop to make widespread change to Rwanda’s primary school pupils. I thank everyone who has supported our work, and who is interested in what we do. 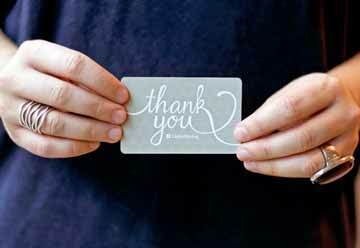 Your donations are what enable us to carry on, and your generosity is wonderful. Thank you so much for your help. Here we are with the first term of the school year over, the two-week holiday just finished and the second term underway. The first term was interesting. At most of the schools where we work, the teachers who had taught English to Primary 1 last year followed their pupils into Primary 2. This has worked well as the teachers know exactly what the pupils learned last year. Some of last year’s Primary 1 English teachers stayed teaching in Primary 1 which also is working well as those teachers know the materials and hence have made a very good start with their pupils’ foundation in English. However, we also have new teachers. This has been a challenge. The new teachers in Primary 1 soon found their feet, but the new teachers of Primary 2 had a very difficult task of not knowing the material used last year, and yet having to assess their pupils’ knowledge and understanding. Another problem was the very long holiday the pupils had had since the end of the last school year at the beginning of November and the start of this school year on 22nd January. 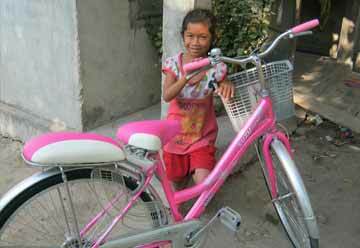 That meant that the pupils had not spoken English for nearly three months, and some had forgotten a lot! Our materials are contained in the New Original English Course (NOEC) books. This is a course of five sets of books covering the six years of primary education. Each set of books has a Teacher’s Guide and a Pupil’s Book. The Teacher’s Guide is comprehensive with very full explanations and instructions for the teachers in their mother tongue of Kinyarwanda, and the English to deliver in each lesson, as well as answers to all exercises in the Pupil’s Books. 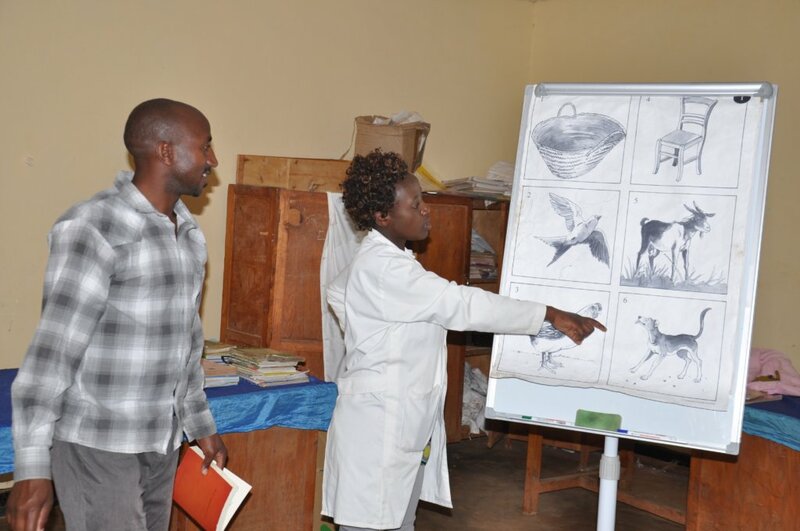 As the teaching methods are within the body of the Teacher’s Guide and given in Kinyarwanda, the teachers can use the books effectively. We are there to provide guidance, and to assist with other matters such as classroom layout, classroom management, and encouragement to the teachers. After a bit of a slow start with some of the Primary 2 English classes, lessons were soon underway with good teaching methods and the pupils learning and progressing. It was wonderful to see how the teachers who had used our materials last year helped the new teachers, and showed that their command and understanding of the teaching methods is now embedded. Primary 2 have now started to read and write in English. Reading and writing skills in a second language are learned differently from those in the first language. However, those new language skills depend on a certain level of competence in the first language. 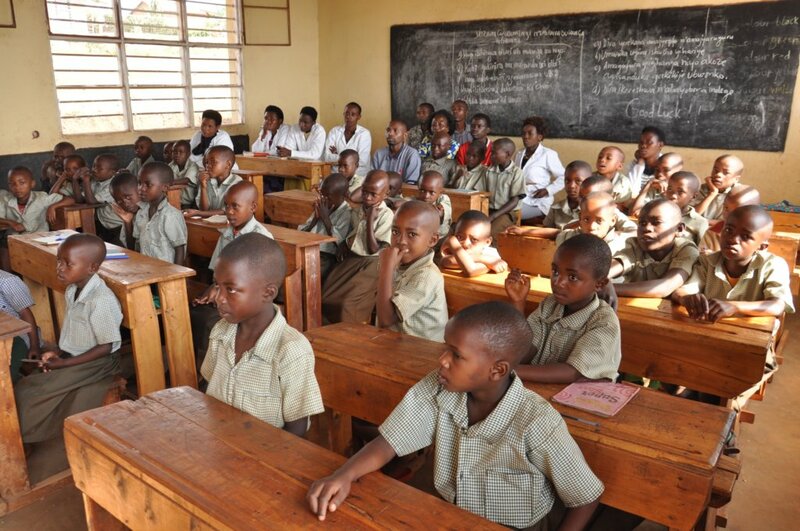 The standard of writing in Kinyarwanda across all the schools is at a very low level. Some pupils form their letters incorrectly, for nearly all pupils their letters are of different sizes, they don’t write on the line, and they have no regard for rules of when to use large and small letters, and most worrying of all, their words have no spaces and so all letters continue with no spaces. So, to help the pupils to write English words is very difficult. It is not the English teacher’s job to teach the pupils how to write, but this is what we are having to guide our teachers to do. We have to find time to help the pupils to write neatly and properly. This is affecting the progress using the NOEC materials, but we hope that the pupils will benefit. The teachers who have been using the NOEC materials for more than a year now are excelling in their teaching methods. They now understand the stages of a lesson, and how to keep the lesson flowing but with different and varied activities. I have observed lessons with more than fifty pupils and more than 90% of the pupils being ‘on task’ throughout the forty minute lesson. This is no mean feat, and it comes from the teacher’s understanding of how children learn and how to engage them with their materials. The new teachers are doing very well, but they specifically asked if they could have a workshop on the use of the NOEC materials. The only time we had was on a Saturday, but the teachers were more than happy with that. We held the workshop on Saturday 24th March and seventeen of our teachers attended. We concentrated on how to introduce a new item of language, with the correct demonstration stage, how to convey the pronunciation, how to use stress, and the correct use of choral drilling and then work with groups and individuals. We also worked hard on the teaching of reading and writing. The teachers enjoyed it, and from their evaluation forms they felt they had gained knowledge and confidence. The end of year examinations which the Primary 1 pupils sat in November 2017 had very good results. 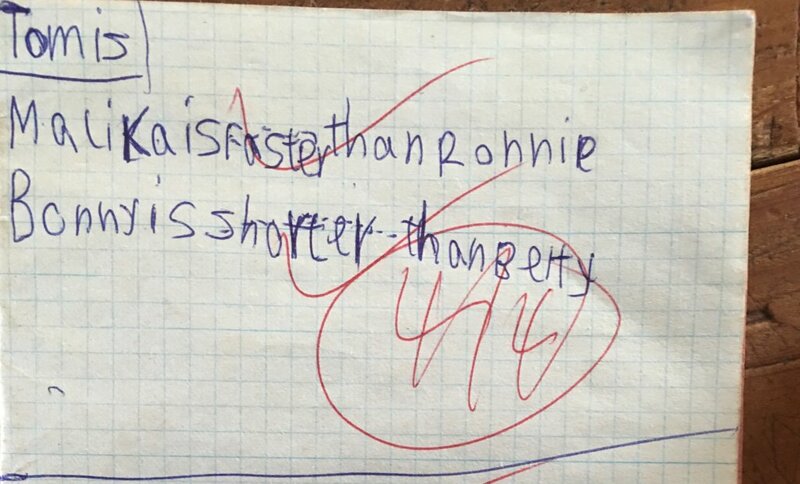 We set the same examination for some Primary 4 pupils in February 2018. The Primary 1 examinations had been oral, and the test we set for Primary 4 was written, but the questions were the same. In all our Primary 1 classes the average score was more than 68%. In the P4 classes, with very generous marking the top mark was 27% and the average score was 9%. This helps to prove our argument that the teaching and learning of English in primary schools using the standard textbooks is not working. The other side of our work away from the classrooms, is advocating for change. We have been trying to see the new Minister for Education but without success. He has been extremely busy and despite being in frequent touch with his private secretary we are still waiting for an appointment. 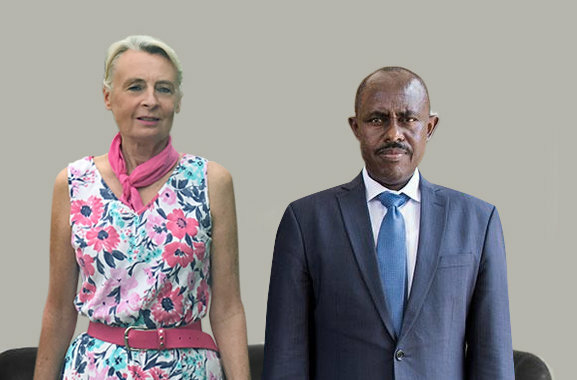 Meanwhile, there has been a new Director General appointed at the Rwanda Education Board, and changes in five other key positions there. This is obviously a time of change, and it is crucial that our voice is heard. 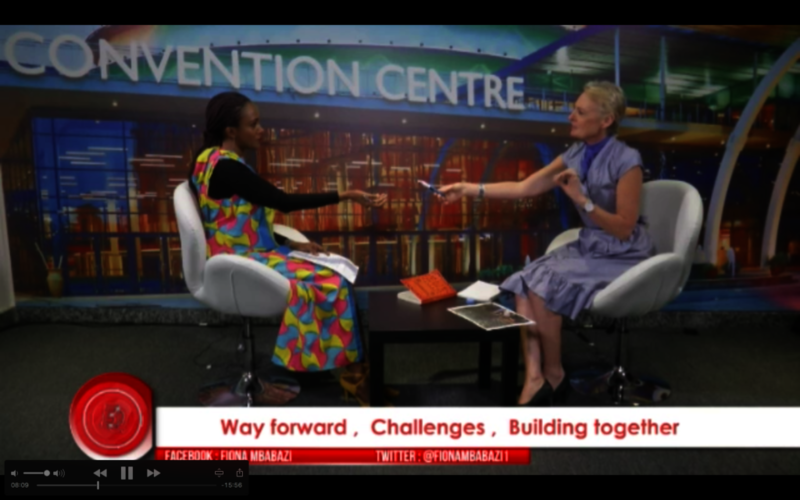 I was asked by the Rwanda Broadcasting Authority to be on The Big Q which is a weekly interview programme covering topical issues on Rwanda Television. I was interviewed about our work in primary education and the teaching and learning of English. A video of the twenty-five minute programme can be found on the following link: https://vimeo.com/259470168. The programme was broadcast three times! I have great hopes that our views and experience will be listened to, and will help to improve the primary education in Rwanda. This is ambitious, but we are doing what no-one else is doing; working in the classrooms with years of experience in East African primary schools and having a great impact which is evidenced beyond doubt by the pupils understanding and using English. 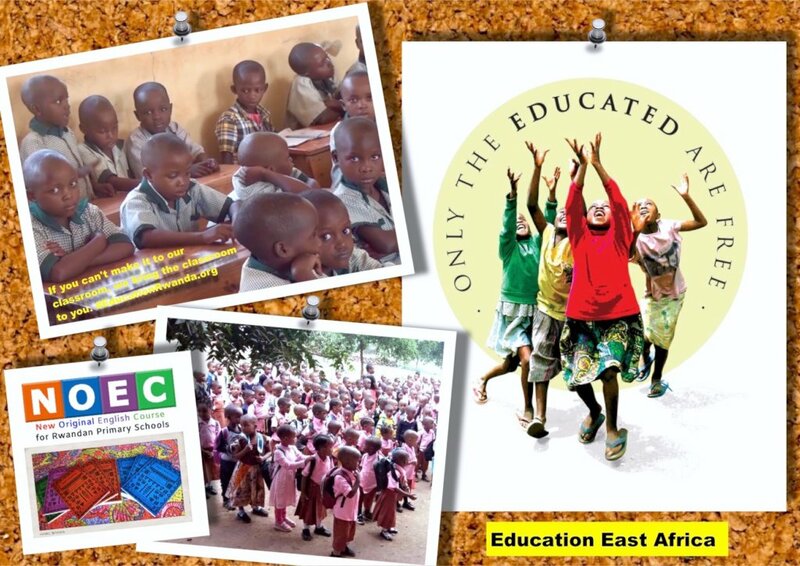 To everyone who is reading this, I thank you so much for your interest in our work, and for your generous donations that enable us to keep going, and for sharing my desire to make life better for children through education. Summer is on its way and let’s hope everything blooms.